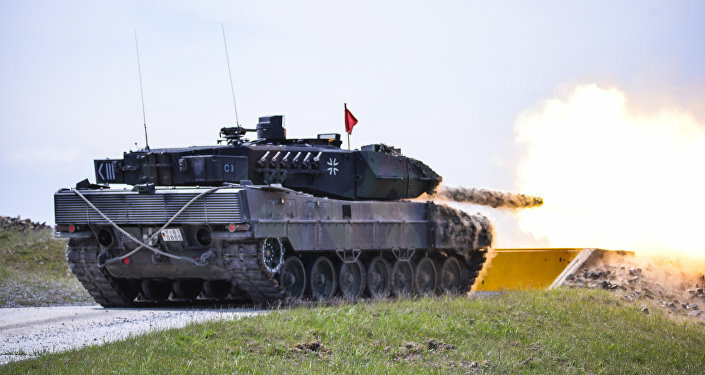 German military giant Rheinmetall Defense has unveiled the prototype of a powerful 130mm smoothbore tank gun which its maker claims is powerful enough to handle Russia’s T-14 Armata and modernized T-90 main battle tanks, Britain’s Jane’s Defense Weekly reported. The technical demonstrator of the 130mm L/51 tank gun, presented during the Eurosatory-2016 arms expo in Paris, weighs about 3 tons. The gun’s 6.5-meter-long barrel has no muzzle break and weighs 1.4 tons. Rheinmetall Defense is developing a new armor-piercing fin-stabilized round for its new gun with new propellant and an elongated tungsten penetrator. The gun will also fire newly developed 130mm high-explosive air-burst rounds. Field trials of the new gun are slated for later this year. Western militaries felt the need for newer and more efficient weapons after Russia rolled out its all-new Armata T-14 main battle tank during last year’s Victory Day parade in Moscow. Judging by their characteristics, the T-14 and other armored vehicles built around the Armata platform, proved way ahead of their current western analogues.